Shop Personalized Cause, the only site to purchase single, individual custom awareness ribbons (pins) with a name, date, cause or message. What causes are associated with the periwinkle blue awareness pin? Looking for Custom Awareness Ribbons? Personalized Cause individually engraves awareness pins with a name, date or message! No minimums. Personalized Cause's signature hard enamel, periwinkle blue custom awareness ribbons (pins), measuring 1.5" (L) x 1" (W), let you wear your message on your lapel. Hand polished to a brilliant luster and smoothness, the personalized awareness ribbon pins feature a thin gold outline and clutch backing. Engraving is included in the price of each ribbon pin, and you can order one pin or many in bulk. We have no minimum orders and are the only awareness pin company that lets you customize one awareness pin at a time. What does an awareness ribbon represent? 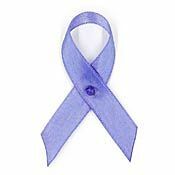 Our periwinkle blue awareness ribbons represent the universal symbol of support. Whether ordering your periwinkle blue custom awareness ribbons (pins) for yourself or over one hundred as fundraising and donor thank you gifts, our periwinkle blue custom awareness ribbons (pins) are the subtle yet standout way to bring support to others and call attention to your cause. Personalize Your Periwinkle Blue Custom Awareness Ribbon Pin with a Name, Date, or Message! Personalized Cause's custom engraving transforms your awareness pin into a keepsake to wear on your lapel or give away as a special gift. Our ribbons make a personal statement by including a space for engraving that lets you wear your message of support or advocacy for others to see. Custom awareness ribbons accommodate up to two lines of text. Please note that there is a 20 character limit per line, black type only, and that personalization appears in place of the words "Personalize It!" in the center of the awareness pin. On your pin, we will center the bottom line under the first if you choose two lines of engraving. Of course, we can engrave more than 20 characters per line, but please be aware that the more characters requested, the smaller the type will be. The size of the engravable area is approximately .25" (H) x 1" (W). You will be prompted to enter your personalization at check-out in your shopping cart. Customization is included in the price of the ribbon pin. Awareness ribbon pins may also be known as badges or awareness badges. 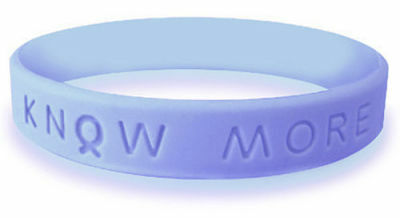 Periwinkle blue awareness products are also available in a non-customized periwinkle blue awareness ribbon, periwinkle blue fabric awareness ribbons in bulk and individual periwinkle blue awareness bracelet wristbands.